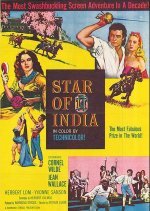 Virtually unwatchable swashbuckler, with Cornel Wilde as the French nobleman who, stripped of his estates, starts a search for a priceless jewel. Jean Wallace isn't stripped of anything but tags along anyway. Herbert Lom hisses like a panto villain and seems to have an unhealthy relationship with his Siamese cats, but this effort looks cheap. Director Arthur Lubin best known for the Claude Rains Phantom of the Opera doesn't help matters with slow pacing.